The whole region around Triglav encompasses the only national park in Slovenia – named after the symbolic mountain Triglav (meaning ‘three-headed’). The best time to climb the summit starts from the beginning of July until mid-October. There are a variety of routes to the top, some are relatively easy whilst other as more challenging, involve climbing and demand experience. Whatever route you choose, all of them include the final one-hour-and-a-half section of via ferrata that reaches the summit. 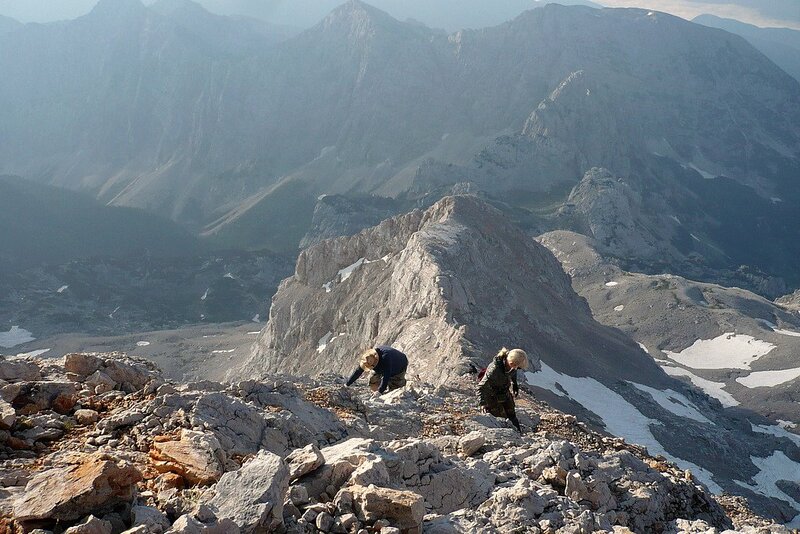 Climbing Triglav usually takes two days. Most of the routes go via a mountain hut at the foot of Triglav on the first day (6-8h), followed by an early start on day two where you will summit and descend (6-8h), either back the way you came or via an alternative route. There are plenty of longer routes in the Julian Alps, though, which incorporate the Triglav summit into a multi-day hut to hut trek. It’s even possible to do Triglav as a day-trip but you need to be in top physical condition with good weather to support your ambitious plans. Here’s a list of several approach routes to climb Triglav that differ by distance, ascent, and technical complexity. Triglav’s North Face is among the biggest in all the Eastern Alps. It’s called the ‘Wall’ due to its huge 1000-metre high and 3000-metre wide limestone wall. The Wall encompasses the hardest routes that climb to the top Mount Triglav. All of the trails on the North Face start from the end of the Vrata Valley, near the Aljažev Dom Hut (1015m). You can choose among via ferratas of all technical difficulties, all of them going up towards the summit. The Tominšek and Čez Prag routes are the most popular ones, while Bamberg is the most difficult and technical one. The Prag route is the standard ascent going from the Vrata Valley to the Krederica Hut. However, it’s used also for descending as it’s the easiest one among the other via ferratas on the Wall. The route crosses the Triglav North Face on its left side. The most difficult part is somewhere in the middle, a 15-metre, almost vertical climb. This section is safely secured over the precipitous parts and even has footholds carved into the stone. In the upper section, the Prag route continues across scree fields and karstic terrain, with the remains of the Triglav Glacier. It eventually turns toward the summit and reaches the high-altitude plateau where the Krederica Hut (2515m) is perched. From here, the classic route climbs to summit Triglav (described at point 1). The Bamberg’s route is the toughest secured via ferrata that leads to Triglav. It’s the longest, the most difficult, and steepest wild route. After reaching the Luknja Pass, the trail turns sharply left and snakes its way up on the right corner of the Wall. It overcomes a few almost vertical and extremely exposed passages, through a labyrinth of narrow glens and abrupt rock cliffs. These are the most difficult climbing sections of this route. The terrain continues its steep ascent but the views over the Trenta Valley are magnificent. You’ll also glimpse the Vrata Valley and the Triglav North Face dropping vertically. From the place called Sfinga (well known among Alpinists), the via ferrata leaves the narrow and exposed ridge and leads to the karstic plateau lying at the foot of Mount Triglav. From there, the footpath will meet the classic route that goes up to the summit from Planika Hut (described at point 1). Although one of the longest routes to Krederica Hut, the Krma Valley, in Triglav National Park, is the easiest one and has no steep climbs or technical difficulties. Because of this, it’s the most popular route toward Triglav, even during the winter months. It also allows a quick safe retreat if needed. The hiking trail starts from a parking spot which can be reached on a 2km tree-laden road from Kovinarska Koča Hut (870m), situated down in the Krma Valley. At the beginning, the path goes gently up through a peaceful forest. Once it climbs out of the trees, you’ll find magnificent views of the Draški vrh walls on the left. The route passes a shepherd hut in a pasture at the end of the valley (1580m), then reaches the foot of Rž Mount. After engaging the valley along the wall of Rž, it turns right on a rounded ridge leading to the Krederica Hut (2515m). Once you arrive at the Krederica Hut, you’ll encounter the first via ferrata section (as described at point 1). This is one of the most scenic multi-day routes in the Julian Alps, integrating a quick ascent to Triglav summit. 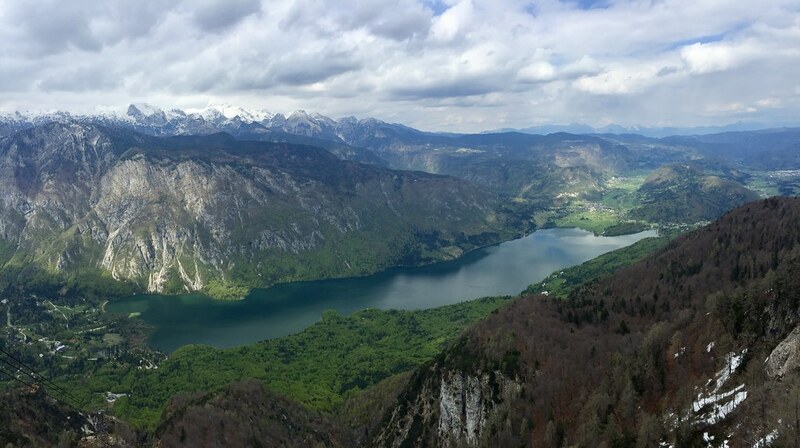 It stretches from the imposing wall of Komarča above Lake Bohinj to the high pastures and glacial lakes very close to Triglav itself. 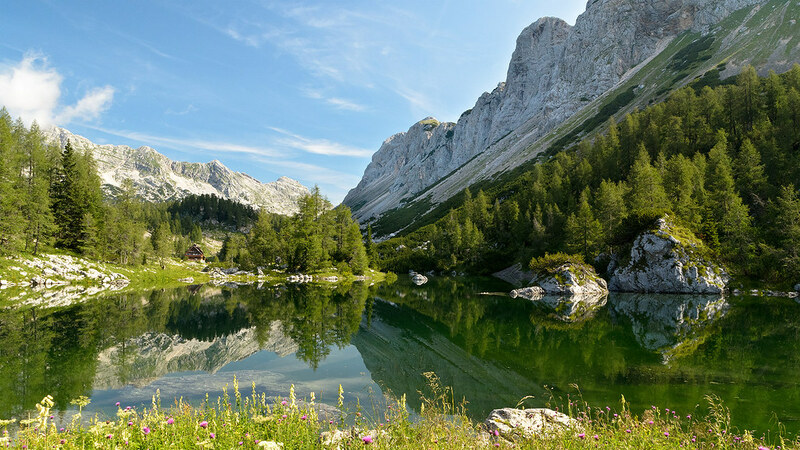 While famous for its seven lakes, it’s easy to hike and maybe the most family-friendly mountain trail in Slovenia. The route traverses a mixed terrain of meadows and rocks with a chain of seven glacial lakes. You’ll pass picturesque pastures, dotted with tiny wooden cottages and lush pink flowers, hilly landscapes, and sharp rock ridges. However, it’s the longest way to ascend Triglav and the best way to hike it is to sleep in one or two huts along the way. The route starts in the alpine pasture of Planina Blato (1147m), above Lake Bohinj. After two hours of hiking, the path reaches the Black Lake (1294m), then steeply goes up to the beginning of the Seven Lakes Valley. There, the Seven Lakes Hut sits right behind the stunning Double Lake (1676m). After passing the Big Lake (1831m), the trail overcomes small limestone steps and reaches the shallow Green Lake (1988m). To see the other lakes (Rjavo, Mlaka, and Vrsac), you’ll have to make a short detour and then turn back to the main route. You’ll glimpse Triglav for the first time after crossing the Cez Hribarice Pass (2358m), where you’ll reach the Dolicu Hut (2151m) – a good place for a well-deserved rest before summitting Triglav the following morning. From the Dolicu Hut, there’s a direct route that climbs up to Triglav over scree slopes and the final narrow ridge to the top (approx. 2.5 hours). Alternatively, there’s the standard way that goes via the Planika Hut (2 hours) over bare rocky slopes secured with fixed cables and pegs. From there there’s a final 2-hour long climb to reach Triglav’s summit (same route as described at point 1). 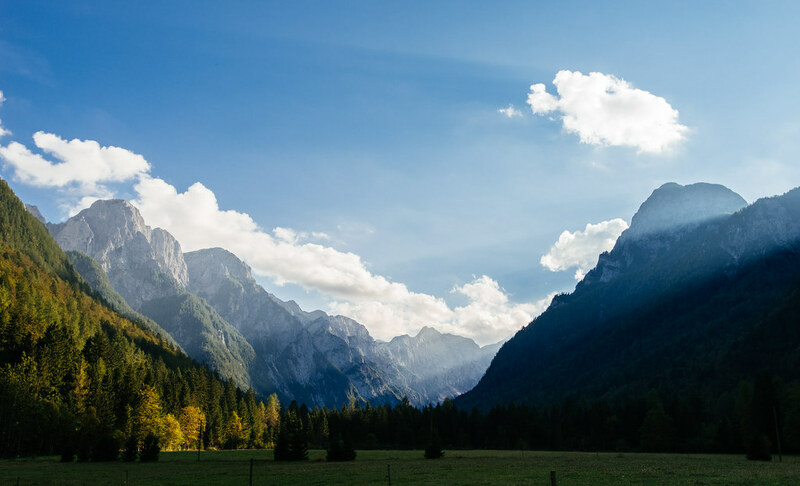 Discover our hand-picked adventure to climb Mount Triglav and other hiking trips in the beautiful Slovenian Alps.